Travellers and locals in the Australian state of Queensland are caught in a real-life Jaws film after a ?monster? shark measuring up to 20 ft long is believed to have mauled another great white shark. As this dramatic picture shows the smaller shark was almost bitten in two. Travelers and locals in the Australian state of Queensland are caught in a real-life "Jaws" film after a "monster" shark -- perhaps measuring as long as 20 feet -- was believed to have mauled another great white shark. As the picture shows, the smaller shark was bitten almost in two. The violent shark-on-shark attack is raising fears along the Queensland coast. Authorities have warned swimmers to stay out of the waters around Stradbroke Island, a popular tourist destination for Australians, while the giant shark remains on the prowl. "It certainly opened up my eyes. I mean the shark that was caught is a substantial shark in itself," Jeff Krause of Queensland Fisheries told the Sydney Daily Telegraph. In one swift bite the larger shark, estimated to be 5 feet shorter than the fictional shark in the movie "Jaws," apparently tore into the side of a 10-foot great white that had gotten tangled in netting near north Stradbroke Island. "That cannibal thing is what great whites do. 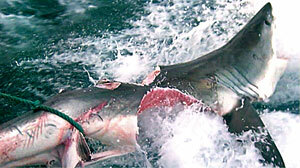 They'll eat anything, including their own kind," shark expert Hugh Edwards told Channel 7 News in Australia. "It would be sensible not to swim in that area for some little while because obviously the big shark has been there." The big bite is not settling well with the local surfers. "Whatever attacked and took chunks out of this big shark must be massive," 19-year-old surfer Ashton Smith told the Courier Mail. "I've heard about the big one that's lurking out there somewhere. We're all being very, very cautious." Australian Marine Conservation Society Director Darren Kindleysides told the Courier Mail that "recent figures on the number of sharks caught showed the nets were working but at huge cost to whales, dolphins and turtles." Shark hunter Vic Hislop also told the Courier Mail he "believes shark nets are too damaging to the overall marine environment, and that methods should be explored to scare away sharks rather than capture and kill them." Despite the complaints from environmentalists, the Australian government has stood by its decision to protect the beaches from predators. Fisheries Minister Tim Mulherin told London's Daily Mail that the capture of the bitten shark -- and reports of a larger one feeding in the area -- are further justification for the protections currently in place. Since the defense program was started 47 years ago in Queensland, there has been only one fatal attack on a protected beach.